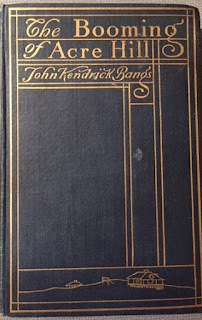 John Kendrick Bangs (1862-1922) was a native of Yonkers, NY. He attended Columbia, and on graduation went to work for Life Magazine, and later for Harpers'. He wrote comic sketches from the beginning, and later a considerable variety of comic short stories, novels, and also poems. The term "Bangsian Fantasy", for a fantasy set in the afterlife, was coined after him, though I'm not sure it's still current -- at any rate, I always use the term "Afterlife Fantasy" for such works. 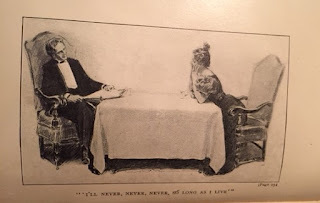 He seemed to have a solid reputation as a humorist in his lifetime, but he doesn't seem all that well remember these days, and on the evidence of the book at hand, I'd suggest that much of his humor has dated a great deal by now. The Booming of Acre Hill is a collection of short stories, all set in or very near the New York suburb Dumfries Corners, which I suspect may have been based on Bangs' longtime home, Yonkers. It is subtitled "and other reminsiscences of urban and suburban life", which seems to imply that the stories may be true, but they are unmistakably fiction. The stories first appeared in the Ladies' Home Journal, the Women's Home Companion, and "the various publications of Messrs. Harper and Brothers". My edition looks like a First. It's published by Harper and Brothers, and illustrated by Charles Dana Gibson. 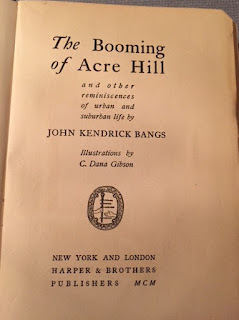 "The Booming of Acre Hill"
"The Strange Misadventures of an Organ"
"The Base Ingratitude of Barkus, M.D." "The Book Sales of Mr. Peters"
"Harry and Maude and I -- Also James"
The bulk of the stories are between 2500 and 3500 words, with the last a bit longer at some 6000 or so. The first 12 are purely about suburban life. The first one is a bit uncharacteristics -- it's not about Dumfries Corners but a new development nearby, Acre Hill, and the scheme to draw buyers, which, curiously I thought, involved hiring a socially connected but impecunious man to rent a house and throw parties to which the rich and upper class denizens of the city will come -- convincing people moving to the suburbs that this was the place to be. This gives a hint as to the class of people living in these "suburbs" -- they all had a couple of servants, for instance. They seem to be professionals, lawyers and the like. "The Mayor's Lamps" and "The Balance of Power" are both about a man who tries to run for Mayor of Dumfries Corners, mainly because he wants the lamps that are gifted to each Mayor. He loses, of course (to his wife's relief) -- the second story is an encounter with a man who represented "the balance of power" -- a working class fellow who felt snubbed by the candidate. Which means that the suburb does have an "other side of the tracks". The last three stories are very light romances. 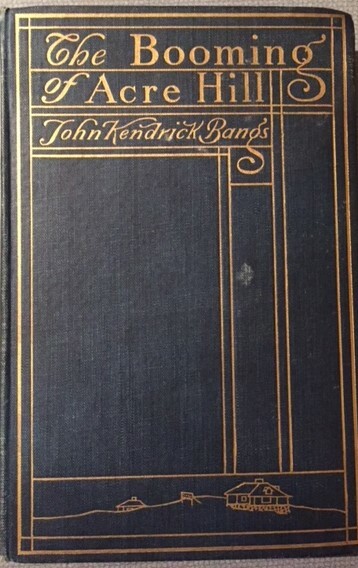 The first is about the narrator's rivalry with Harry for the attentions of a pretty girl named Maude -- and as they debate who has the better case, James swoops in and takes her affections. The second describes two excellent young people, who have not married despite closing in on 30. They are perfect for each other. But the man lives in New York, and the woman in Boston. The story ends "But they never met. And they lived happily ever after." And the third concerns a woman who is constantly playing matchmaker. Her husband finally convinces her to stop, but then she insists on trying one more time ... and after some wrong turns, a fortunate scheme works out. The other stories are about the misadventures of ordinary life in the suburbs, very much in the tone of, say, a 1950s sitcom. My favorite in the whole book is "The Book Sales of Mr. Peters", in which a vestryman at the local church is inveigled to arrange a book sale in order to raise money to fix the roof. The inconvenience of the sale is amusingly described, but it makes what seems a nice profit. So the next year he is importuned to repeat the sale. He agrees, then nothing seems to happen. So he shows the importuners how much the previous year's sale actually cost him (far more than the profit), and happily writes them a check for the needed amount, glad to have saved himself a lot of money. There are, I think, two kinds of comedy -- comedy that shocks us, disturbs us, and makes us question the nature of the world or of our lives and society; and comedy that reassures us that's all is right with the world and our place in society. These stories are most definitely of the latter sort. They are reasonably amusing, but terribly dated, and I think it is their conventionalism and refusal to challenge the reader that date them, and that make them essentially forgotten. A shock of recognition: that's the very same edition of this book that I have on my shelf, picked up at a yard sale quite a few years ago. Guess I really ought to get round to it, now I've read your review! "Dated" sounds just what I'm in the mood for right now. Oops: "get round to it" = "get round to reading it."